Interview with Cornelia Sollfrank & Rachel Baker, Furtherfield.org, 2016. We are quite theoretically aligned to the complexities inherent in Haraway’s work – cyborgian concerns – which examine human/machinic coupling adapted to an age where that coupling isn’t necessarily restricted to silicon chips and hardware, but it equally refers to the very ability to hack one’s biological/endocrine operating system. What we glean from such an understanding, is that we can’t simply ‘invest’ in the virtuality of online being as an emancipatory category unto itself, and we need to focus on how virtuality can be better interfaced with material existence. Furthermore, the sprawl-like functioning of online life has since been consolidated by a movement of deep centralization (mainly one search engine, one shop, one social media platform, etc. ), so our collective efforts require systemic consideration. We need to conceive of larger structures of governance/justice that are commensurable with these new couplings; we need to focus on the construction of a milieu where the real and virtual, abstract and concrete couplings are politicized towards an emancipatory horizon. 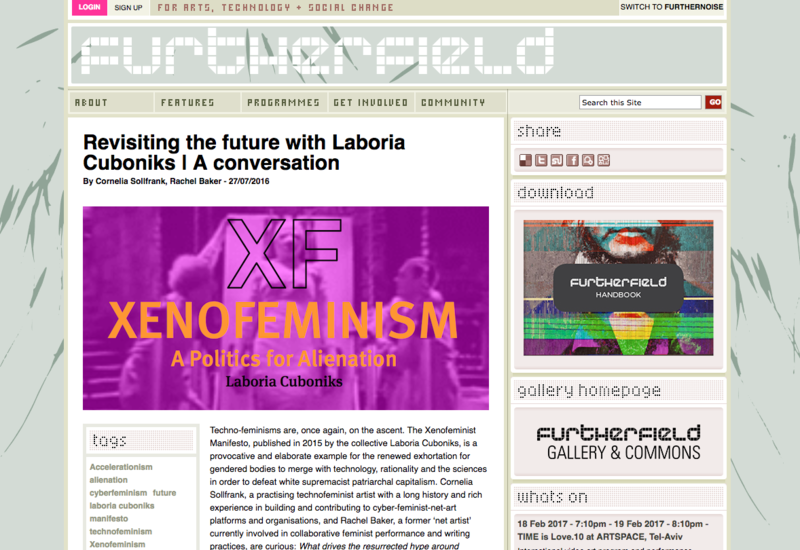 Laboria Cuboniks in interview with Cornelia Sollfrank & Rachel Baker, Furtherfield.org, 2016.